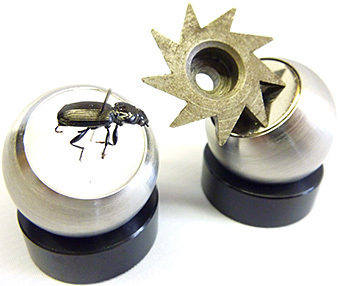 The Watkins & Doncaster E741 Insect Examination Stage enables pinned specimens to be rotated through 360°, raised and lowered. 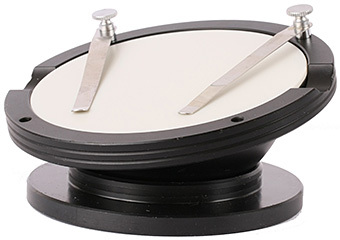 The Bioquip 6188 Microscope Stage, patterned on an old Watson item, enables pinned specimens to be rotated about 2 axes. The semicircular cutout in the base allows transmitted light to be used. 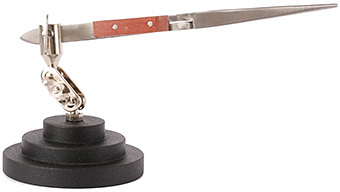 The Helping Hand comes with 2 adjustable crocodile clips and a magnifying glass (not needed with a microscope). Available from tool shops or on eBay. Reverse tweezers mounted on an adjustable stand, supplied with 2 pairs of tweezers, one straight and one curved. They are called “reverse” because they grip the specimen when you let go. Available from model shops or on eBay. A non-slip mat helps to stop heavy items sliding off. It is easy to make a similar stage using domestic items, in a variety of sizes. A home-made cup stage. The base is made from a strip of thin card, rolled up and stapled to form a cylinder. The ball is a bowl from a kitchenware shop. The top is a cork coaster; just by good fortune the 75 mm diameter fits perfectly onto the ball; it is held in place with UHU glue. The top could have been made of Plastazote, and can be covered with card or paper if a black, white or coloured background is desired. The ErgoBall is a 30 mm steel ball supported on a 10 mm high base. One version has a magnet for holding specimens, the other version has a 20 mm disc of white Plastazote for holding pinned specimens. A 40 mm high base is available as an option. For more information, go to www.fullerscopeservices.co.uk, or search for ErgoBall on eBay. 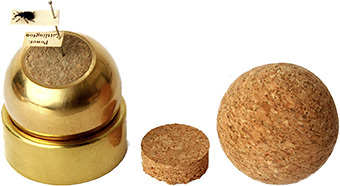 Quekett member Martin Hinchcliffe makes a holder that he supplies with one 30 mm cork ball and one 30 mm brass ball with a cork insert (and 2 spare inserts). 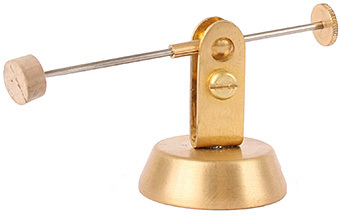 The brass base is 12 mm tall. 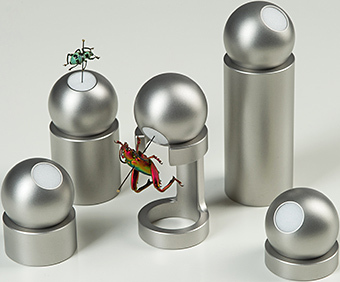 The Entoball is a 30 mm steel ball hollowed out to hold a 12 mm disc of Plastazote. 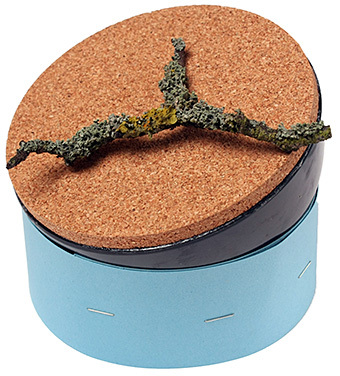 Five bases are available, 8 mm, 16 mm, 32 mm, 48 mm (with cut-out) and 64 mm high. For details and prices, contact Stefan Ober (stefan.ober@entoball.com) or Microscopes Plus. 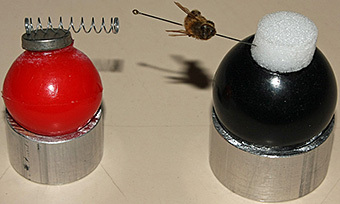 Two small home-made ball tables, one with a magnet for holding specimens, the other with Plastazote for holding pinned specimens. The bases are short lengths of metal tubing. The balls are control knobs. 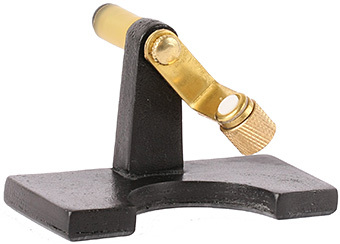 Jewel tweezers, also known as gem forceps, attach to a threaded hole in the base of the microscope, and allow an object to be rotated through 360°. Available from microscope manufacturers or from eBay sellers such as MicroscopeNet, Microscopes India and Precision*World (search for tweezer in their stores). 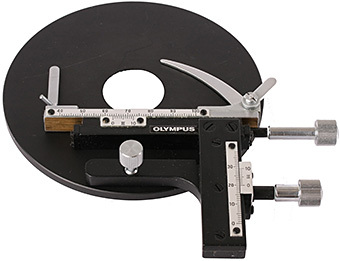 A mechanical stage with horizontal controls like this Olympus FM-III Mechanical Stage attaches to a stage plate and provides precise movement of microscope slides. If your stage plate does not have a central hole for transmitted light, you can buy a spare and drill or cut a hole in it. 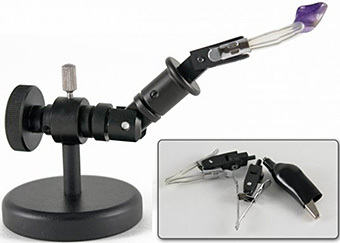 The Dino-Lite MS16C Specimen Holder has pivoting and rotating joints that allow a specimen to be viewed from any angle. 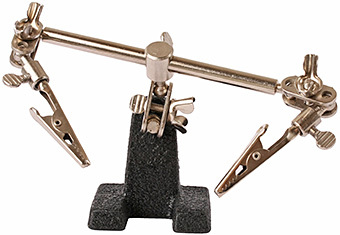 Supplied with 3 types of clip for holding a variety of specimens.